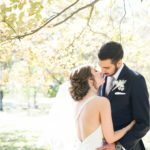 It’s been 1 year since Ryan & Sarah’s October wedding at Big Spring Country Club. The day was filled with so many special and memorable moments, lots of love and tears of joy. Sarah and Ryan took a moment together before their ceremony, to share a prayer and a shot as a toast to their big day, and their big moment of becoming Mr. & Mrs.